During my prolonged hibernation, the Los Angeles Review of Books (of which I am a contributing editor, with a promised essay on Tintin on the endless To Do list) has unveiled its temporary home. Of particular note is Kathryn Schulz's take on Saran Bakewell's marvelous and engaging How to Live: or, A Life of Montaigne in One Question and Twenty Attempts at an Answer. Please attend this night of readings, music and dancing to raise money for medical aid to Haiti. The evening will feature readings from Will Alexander, Gloria Alvarez, Tisa Bryant, Percival Everett, Sesshu Foster, Veronica Gonzales, Jen Hofer, Doug Kearney, Chris Kraus, Maggie Nelson, Abel Salas; plus live music from Ceci Bastida and Domingo Siete and DJ sets from Glenn Red, Concise, and Gomez comes alive. It will all get started at 8pm this coming Saturday at Trópico de Nopal Gallery in Echo Park. All the money raised will go to Partners in Health, which has been providing free medical care to Haiti's poor for the last two decades. If you won’t be able to attend Saturday, please consider donating directly to Partners in Health. Michelle Huneven is the author of three novels including her most recent, Blame (Farrar, Straus and Giroux), which has already garnered raves including a Starred Review from Publishers Weekly. Her nonfiction writings include restaurant reviews for the Los Angeles Times and the Los Angeles Weekly, other food journalism and, with Bernadette Murphy, the Tao Gals Guide to Real Estate (Bloomsbury). She has received a General Electric Foundation Award for Younger Writers and a Whiting Writers’ Award for fiction. Michelle lives in Altadena, California with her husband, Jim Potter. Michelle kindly agreed to take time out of her rather hectic book tour to chat with TEV about her new novel. DANIEL OLIVAS: When you’re asked to explain what Blame is about, what do you say? And then I say, But it’s also funny. Or maybe you want a more abstract take, in which case I might say that Blame is about a character who leads a life based on a desire to be good, to atone, to be of service to others only to discover that maybe she didn’t really HAVE to live that way. Blame asks the question: Is a life based on goodness, service, and humility worth living, even if the trigger for living such a life was misbegotten? OLIVAS: Choosing a title for a novel can be both exhilarating and exasperating. The one word title of your novel is unflinching, almost accusatory. How did you decide upon it? Can you share with us some titles that didn’t make it? HUNEVEN: This was the hardest title to find! I started writing the book thinking that one of the key characters would have a part time job giving scrapbooking workshops and selling scrapbooking supplies—such people are sometimes called “memory consultants.” So the original title was, The Memory Consultant. But then the character never became a scrapbooker, and I didn’t have a title. When I finished the draft I sent to my agent, I had the most spineless title—After All, I think. I don’t really remember. I knew it was terrible, but wanted something on the title page. My agent, who has since retired, suggested Patsy’s Fault, which had resonance, but I found a little too jaunty for the book. A close friend, also a novelist, suggested Blame, and that’s how the book went out to publishers. After she bought the book, my editor Sarah Crichton wanted a title that was a little less thematically pointed. We looked long and hard for something else. I had all my friends helping, or trying to. For All She Knew was one contender, but I could never remember it, and if I couldn’t remember the title of my own book, how would other people recall it long enough to get to the bookstore? Another contender was Patsy MacLemoore, but to me it was a little too Olive Kitteridge-ish—same syllabic count. Blame was memorable. It may not be the very best title for this book, but after months of searching (and I paged through the Bible, most of Shakespeare, not to mention Yeats, Stevens, Bishop, and Rumi...) and boring my friends to death, I came up empty handed. By then, my editor had decided that Blame was the best and only title for the book. OLIVAS: You do a bit of a head-fake in the first chapter focusing on high school girl named Joey who ends up in the drunken care of her handsome uncle, Brice, and Brice’s girlfriend, Patsy MacLemoore. It isn’t until the next section of the novel that you focus on the true protagonist, Patsy. The effect is wonderfully disconcerting. Why did you begin the novel in this way? HUNEVEN: The first part of the book was written a long time ago as a short story. Years later, when I decided to write about a young female blackout drinker who runs down two people, I knew exactly who she was: Brice’s girlfriend, Patsy, from that story. Then, it turned out that the story was an interesting oblique first glimpse of Patsy in action. I know it’s odd that I start the novel from Joey’s point of view and then, after 18 pages, shift over to Patsy’s for the remaining 286 pages. I tried many ways to ease that transition, adjust the point of view, but nothing I tried worked. And that’s been the story with this book: stubborn flaws. Better title? No luck. Better beginning? None to be had. I’m glad you find the effect wonderful in a disconcerting way. To my mind, it allows the reader to meet many of the book’s main characters in a tight little side narrative, thus finessing any need for big hunks of back story in the main narrative. OLIVAS: Altadena, Pasadena and other parts of Southern California are almost characters in the novel. Are you a native? Do you have favorite authors who have been able to capture the complex and ever-shifting So Cal milieu? HUNEVEN: I am a native. Here in Altadena, I live one mile due east of the house where I grew up. As a kid, I always thought I’d live far, far away, Brasilia or Mumbai. But then, I was unaware of the deep pleasure of feeling deeply at home to a geography, of belonging. Altadena is a funkathon, a hoot, a beautiful messy little scrap of rustic suburbia and it suits me to a T. I aspire someday to write the great Altadena novel. I think nobody captures the complex and ever-shifting milieu of So Cal better than Jonathan Gold, restaurant writer at the LA Weekly. OLIVAS: Patsy’s experiences in California’s correctional system ring true. How did you research this? HUNEVEN: I once worked on a long investigative article about the California Youth Authority system, and the children’s prisons—er, detention centers—sunk a deep root in my imagination. The filth, the institutional lack of any nicety, the noise, the lack of privacy, the burnt out guards—all these factored into the punishment. I also read up on women in prisons—I read Jean Harris and Wally Lamb and Jennifer Gonnerman and a how-to guide entitled, You’re Going to Prison. I looked at all the rules for visitors on line, and descriptions of all the prisons, the photographs. I also talked to all the people I knew who had spent nights in jail or time in prison. One idea came crystal clear: I never want to go to prison, and neither do you. OLIVAS: Now that you’ve made book appearances for Blame, have you gathered any unusual or interesting responses to your novel? HUNEVEN: A few people have said that Blame has helped them rethink and/or come to terms with a dark incident in their pasts. Some people seem really FURIOUS and OFFENDED that I didn’t use punctuation marks. One woman sent me an email saying that after a few pages, she took my book right back to the library because it had no quotation marks! She was going to try my other books, she said, but if they didn’t have quotation marks, she’d take them back too! Daniel A. Olivas is the author of five books including the newly released short story collection, Anywhere But L.A. (Bilingual Press). His writing has been widely anthologized including in the forthcoming Sudden Fiction Latino: Short-Short Stories from the United States and Latin America (W. W. Norton, 2010). Olivas has written for the Los Angeles Times, The Jewish Journal, the El Paso Times, and shares blogging duties on La Bloga. SPECIAL TEV GIVEAWAY: CHARLES BUKOWSKI'S L.A.
focuses on Bukowski’s great passions: writing, screwing and Los Angeles. We’ll take in the canonical locations of his life and myth: the Postal Annex Terminal where he gathered the material for “Post Office,” the De Longpre apartment where he briefly experimented with marriage and fatherhood, one of his favorite bars and liquor stores, and many other spots. Along the way, we’ll explore the people and ideas that made up the warp and weft of Buk’s rich inner life. This Esotouric bus adventure is hosted by Richard Schave. "Haunts of a Dirty Old Man: Charles Bukowski's LA" spans Bukowski's personal city, from Skid Row to once-genteel Crown Hill, to Bukowski's favorite East Hollywood liquor store, the Pink Elephant. 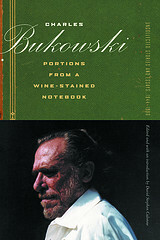 The tour also includes a stop at one of several bars notorious as Bukowski haunts. In addition, the lucky attendee will also receive a free Bukbird beer coaster featuring Tony Millionaire's cartoon bluebird character, and a very special gift from City Lights Books, a pre-release copy of their Charles Bukowski anthology "Portions from a Wine-Stained Notebook: Uncollected Stories and Essays, 1944 - 1990." "Portions," to be published in September 2008, gathers many essential, uncollected pieces including his first and last short stories, and his first "Notes of a Dirty Old Man" column. Many of the writings have only appeared in 'zines, newspapers, chapbooks, and magazines. Additionally, "Bukowski - Born Into This" director John Dullaghan will be on the bus. The tour is a $55 value and, for obvious reasons, you need to be in L.A. on Saturday, May 31 to collect. But if you're interested, please drop an email with the subject line "TO ALL MY FRIENDS" and include your full name, please. Previous winners may participate in this one, and we'll take all entries until 8 p.m. PST at which time the Random Number Generator will pick a lucky winner. UPDATE: Congratulations to Juanita Poareo, who will be going on the Buk tour! L.A. Observed reports the terribly sad news - Duttons Beverly Hills is closing after two disappointing years in the land of facelifts and Range Rovers. Like Murder Ink in NY, the store will be shuttered December 31. KAUFMAN, PYNCHON, ERICKSON - IS THIS REALLY THE LA TIMES? David Ulin makes an awfully convincing argument that Charlie Kaufman is the best writer of his generation in West, the L.A. Times weekend magazine. Not only is Ulin doing great work for the Sunday Book Review (this week's edition features reviews by Emily Barton and Ben Ehrenreich), but his fascinating homage to Kaufman is uber literary fare for Sunday morning. Pynchon, Erickson, Lethem, Saunders and Kipen are either addressed or interviewed for the piece. What's next bagels with Bataille? The LA Weekly takes a look at the Los Angeles literary salon scene. Here in L.A. the literary scene has equal parts Hollywood glamour and Eastside edge. Besides its literary magazines (Swink, Black Clock, The Los Angeles Review) and smaller indie presses and imprints, there are also a dozen regular literary salons and another half-dozen not-so-regular salons, many of which come with a heavy dose of industry participation on both sides of the stage. The finalists for the 2005 Los Angeles Times Book Prizes can be found here. Of particular note is the nomination of Garner for the First Fiction Award. We are entirely confident that without its LBC attention, Garner - a tiny book from a tiny independent press - would surely not have made this list. So to all the journalists who have asked what kind of a difference can LBC make, there's your answer. It's about bringing attention to titles - the rest is up to you. We haven't watched the Oscars in years (it's a great night to eat out) but Ed's invited us to opine at his Oscar Blog, so we'll be there. We've already weighed in with screenwriting predictions. Even the Director of Literature at the National Endowment for the Arts has to hit the road if he wants to sell books. And it is Oscar week, after all. So David Kipen, the former Book Editor of the San Francisco Chronicle and couch-sitter on "The Today Show," will begin later this morning at KQED in San Francisco and end up—four book signings and four hundred miles later—at Book Soup in West Hollywood at 7 pm. Along the way, the author of The Schreiber Theory: A Radical Rewrite of American Film History will post his bookstore-and-highway observations exclusively here at LA Observed. Kipen is the first guest-blogger ever at LAO, so we're keeping the rules simple: he can say whatever he wants, unedited and unfiltered (because we know where to find him.) His dispatches are due to begin arriving some time after 11 am. Stay tuned, as they say.